NOTE: We're not going through and re-evaluating / changing every site name in the network. The guidelines below are what we will use for new sites created going forward, and if the community supports it, we'll be dropping the "& Usage" part of our language sites only. no other names for existing sites are changing. With 110 sites in the Stack Exchange network, now is a good time for us to think about how our current sites are named and how we should name them going forward. Some of our site names are pretty outrageously long. "Motor Vehicle Maintenance & Repair Stack Exchange" doesn't exactly glide off the tongue easily if you want to talk to your friends about the site. Sometimes our site titles contain words that don't really add anything meaningful to the title. Until now, our language sites have followed the naming convention of "X Language & Usage Stack Exchange", but why? It seemed to make sense at the time, but as we've grown, it's become clear that "& Usage" isn't really necessary. A site about a particular language is, by definition, concerned with the usage of that language — that's where all the questions come from! Names should be as short as possible while clearly capturing sites’ topics. Language sites (with one major exception, which I'll get to in a minute) should generally just be called "X Language Stack Exchange" — we should drop our habit of tacking on "& Usage", and keep the site names short. We should avoid having ampersands (and thus multiple topics) as much as possible, except where absolutely necessary for clarification purposes. The subdomain should match the site title as closely as possible (even if it's not the shortest possible subdomain we could use). We can still create redirects if there's a true need for them. We typically avoid renaming sites once they've gotten out of Area 51 — and especially if they've graduated and received a custom site design — and that continues to be true. I am not suggesting that we go through and rename the majority of sites that currently exist. However, one specific group that I'd like to discuss is the language sites. We recently launched Italian Language (in private beta at the time of this writing), and its astute users noticed that we dropped the "& Usage" from the name. Going forward, that's the naming scheme we'll use as a default — just "X Language". I would also like to address the existing language sites. Given that most of them are in beta and therefore wouldn't need a complete redesign to accommodate a name change, I think it's worth standardizing them to the new format by dropping "& Usage" from the title. There needs to be one major exception to this naming convention, though. I do not propose changing the names of our two English sites; English Language & Usage and English Language Learners should remain as they are. The most obvious reason is because there are two sites whose names are very similar — those extra words are needed to disambiguate the purpose of each site. Furthermore, English Language & Usage is by far our oldest language site, and the only graduated language site; the name has been used for a long time, and changing it now would be more confusing than leaving it as is. I'm posting an abbreviated version of this proposal to each language site's meta so that each community can have a discussion about its particular concerns, but I wanted to open up a general thread here for discussion of the policy as a whole. Update 11/25: Thanks for your feedback! We're going to go ahead and drop "& Usage" from the site title of all our language sites except English. Those changes will be made in the next couple of days. "Motor Vehicle Maintenance & Repair Stack Exchange" doesn't exactly glide off the tongue easily if you want to talk to your friends about the site. Yeah, that could totally just be Motor Vehicles Stack Exchange (continue reading). Sometimes our site titles contain words that don't really add anything meaningful to the title. I think one major point you're missing here is that the title does not need to capture the entire scope of the site, which I think is where a lot of these titles come from. Running off the Motor Vehicle Maintenance & Repair example, it's clear that the intended scope of the site was meant to be just maintenance and repair of motor vehicles (which is the topic of the site). The problem there is that the title focuses way too much on the scope of the site, which takes away the focus of the general topic that the site covers. That would be similar to renaming Stack Overflow as "Programming, Algorithms, & Software Development Tools" - Yes, it identifies what the site is about pretty clearly, but it's also a terrible title. It can also limit the scope of the site from growing. What if at some point the Motor Vehicles community decides that just maintenance and repair is still too small of a scope, and they want to expand their horizons into, perhaps, construction of motor vehicles? Well, the site title makes that pretty hard to do since it specifically mentions only maintenance and repair. The conflict would likely result in a new site proposal to cover construction, two sites that cover motor vehicles, and a split community that could very easily be merged together. The title should focus on the topic and exclude any and all mentions of the scope. That's what the about page and help sections are for. 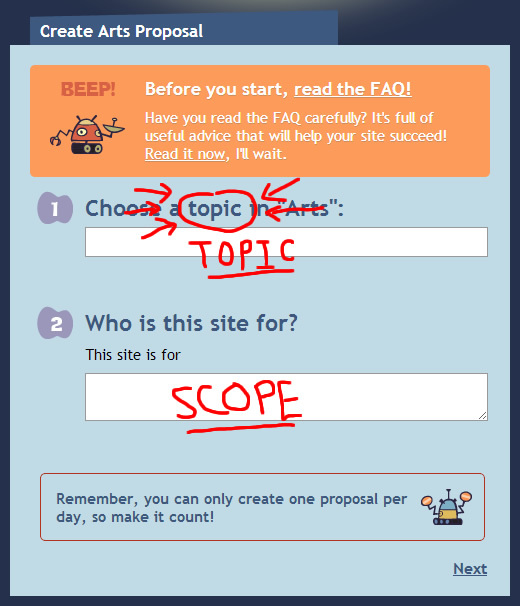 Scope can change over time and thus if the scope is part of the title, the title itself would also need changing over time. I think if you can nail in the idea that the title should be about a topic, and not a scope, we'll probably see this odd lengthy title fascination disappear. The Area 51 proposal process already provides the two boxes needed, let's use them properly! This is completely true. But I think it worth mentioning that I personally wouldn't say that if I was talking to someone about that site; I'd leave off the "Stack Exchange" part. (I still think "Motor Vehicle Maintenance & Repair" is super long to say, but that's not the point I'm trying to make :)). I would pretty much never add the "Stack Exchange" to the end of any of our site names when talking about them to others in person. When I'm speaking in chat or comments on an SE site, often I (and others) will abbreviate with "sitename.SE". More often we'll just refer to the name of the site without the "Stack Exchange", either in whole or abbreviated depending on the length. Hey, so you know Stack Overflow, right? Well the people that made Stack Overflow have a bunch of other Q&A sites too, in the same format but about different topics. There's one about helping non-native speakers learn English. I answer questions and moderate over there. It's called English Language Learners... I think you'd like it. I can write down the web address if you want. Nowhere in there did I actually say the words Stack Exchange. Now that I'm thinking about this, in the interests of brand awareness, maybe I'll start adding a parenthetical "...the people that made Stack Overflow (they're called Stack Exchange) have a bunch of...". But I haven't done it in the past. Oh, well, there's a network of Q&A sites called Stack Exchange. Each site is about a different topic, and people can ask an answer questions there. You get a lot better answers than on a traditional forum, because the focus is on questions and answers." And then I'd segue into the "There's one about English" part. So there I did actually say Stack Exchange, but I still wouldn't have said it as part of the site name. To me the name is just the name; "English Language Learners", "Movies & TV", etc. My brain doesn't append the "Stack Exchange" to the end of the site name. When we talk to each other in chat it'll sometimes append the URL... We'll say things like "space.SE". But that's not quite the same thing. So anyway... This got kind of long and I don't know if it's actually useful information for you guys or not. But I've been mulling it over since you first posted this, and I figured that if there was any chance it could be helpful it was worth posting :) I guess what it boils down to is that, at least for me, I don't consider "Stack Exchange" to be part of any of the site names, and any reference to the actual company name is a side note when I'm discussing it with people... I focus more on the actual site and community I'm discussing. So, do with this what you will (or nothing at all!) :) Just thought I'd mention it. While we're considering dropping & Usage, might I suggest that we consider dropping Language as well? I don't think there's too much risk of confusion as the names of the languages are mostly adjectival forms for other meanings (a site named French is probably not about the country of France, so to speak). With respect to the English sites, I would also support EL&U => "English" (assuming community support, given it's a graduated site), and ELL => "English Learners" (actually, I never loved the site name, but that's neither here nor there). Would it be more appropriate to re-title the language sites into their native languages? It is possible the answer to this question may well be "Yes," but the implementation may well depend on the ongoing Localization effort; perhaps we don't want "El Idioma Español" until the rest of the UI is in Spanish, as well (??). Such a change may also warrant a URL change (or alias) (espanol.stackexchange.com); and such a re-name may not be as straight forward in some languages (especially those with non-Latin alphabets--already the ñ in español may provide for confusion in a URL). I would submit that Board & Card Games needs the ampersand. I think though that each site will have to figure out what they think is important in the name. There are several reasons to use URL shortening. Often regular unshortened links may be aesthetically unpleasing. Many web developers pass descriptive attributes in the URL to represent data hierarchies, command structures, transaction paths or session information. This can result in URLs that are hundreds of characters long and that contain complex character patterns. Such URLs are difficult to memorize, type-out and distribute. As a result, long URLs must be copied-and-pasted for reliability. Thus, short URLs may be more convenient for websites or hard copy publications (e.g. a printed magazine or a book), the latter often requiring that very long strings be broken into multiple lines (as is the case with some e-mail software or internet forums) or truncated. There almost no chance we will start a site for a processed pork foodstuff. On the other hand, shorting http://reverseengineering.stackexchange.com to http://re.stackexchange.com fails the ambiguity test since there are too many meanings for RE. Sometimes, the URL just needs to be long. Therefore, I propose we shorten the subdomain iff the URL communicates the same thing as the site title without sacrificing much in terms of clarity. When verbally telling someone how to get to a site. I understand that my usage is not typical (not many people need to go to any one of the 116+ sites at the drop of a hat). But I expect most people would prefer a slightly shorter URL if they have to think about the URL at all. We should either be careful to assign minimal URLs or be extremely generous with creating new redirects. Not the answer you're looking for? Browse other questions tagged discussion area51 policy site-name .